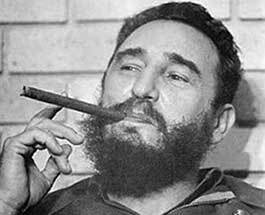 In the course of doing research I came across the speech given by Fidel upon his arrival in Havana after Batista left for the Dominican Republic. During the speech, a white dove came and perched on his shoulder, a staged showing that Providence was smiling on him. With the hindsight of 62 years, it is painfully clear that the democratic elections promised in the speech were illusory and that the Cuban people traded one despot for another, only in the process the middle and upper classes, and with them the relative prosperity of Cuba, were decimated. Here is the speech in its entirety. Reportedly, it took 9 hours to deliver. away, as they did, the revolutionary ideal. pursuit of other unknown but inadmissible goals. troops capable of winning the war alone are the people. or captain. The interests the revolution serves are those of the people. of subjection. We here want peace as it is: to the benefit of the people. repression. Perhaps this is the joy which is most keenly felt now. left master of the revolution in Cuba. strong organization would take up the concerns of our people. want the people to tell my honestly if this is or is not the truth. factor in making the triumph of the revolution complete. not there exclusively. It was the product of the joint efforts of all. changed it, although we have won many battles. i still want to be a major. highest rank is that of major, although there are more than one can count. the right to challenge them. seek to deceive in order to assume their prerogatives. Now the republic and the revolution are entering a new phase. it not an honest government which serves the interests of the people? interests of the people? Well, today they have it. disturbed the peace of this nation? nature, because the triumph is too recent to permit embarking on polemics. the reason, the right, the peace and the history of Cuba. freedoms and peace of the people. or dictatorship. Today there is only happiness. upon me in the same words as they have done today. depart, and they could see how long this lasted. those who have murdered will never save anyone. if we can have peace in the republic this way. appointed commander of the army, and they have talked of a political army. Is this a political army? That which has the support of the people? defend the right and the people. They are not for committing misdeeds. jurisdiction will be taken up again to fulfill their duty. kept pure and useful to the citizens. such a people is well worth it. triumph of consolidation will not be long in being achieved. people, among the journalists and in all the other sectors of the country. plenty of room here in Cuba to do so. everywhere, anyone can talk with me. The demands of all will be met. strategy, or anything like it. He knew nothing of military matters. Why?